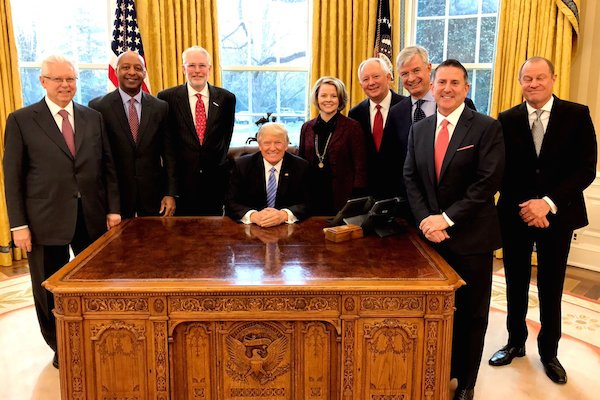 WASHINGTON — Promoting his economic platform with business leaders, President Donald Trump today met with top retail executives at the White House. Mass market retail executives at the meeting included Stefano Pessina, executive vice chairman and chief executive officer of Walgreens Boots Alliance, and Brian Cornell, chairman and CEO of Target Corp.
Other retail chief executives at the meeting included Hubert Joly of Best Buy, Marvin Ellison of JCPenney, Art Peck of Gap, William Rhodes of Autozone, Jill Soltau of Jo-Ann Stores and Gregory Sandfort of Tractor Supply Co.
“Given the retail industry’s position as America’s largest private sector employer, retailers welcome the opportunity to speak with President Trump about policies that will spur job creation and economic growth here in the United States,” Brian Dodge, senior executive vice president of public affairs for RILA, said in a statement. RILA’s members include more than 200 retailers, manufacturers and service providers, which combined account for more than $1.5 trillion in annual sales and over 100,000 stores, manufacturing facilities and distribution centers.